The recession’s latest victim in Japan may not be corporate earnings but the political careers of the ruling party in the country’s parliament. This Sunday in Japan, voters go to the ballot box in what poll after poll shows will be a historic shift in political power, booting out the ruling party. The Liberal Democratic Party, or the LDP, has been in nearly continuous control of Japan’s parliament for more than five decades. But the country’s worst recession since World War II has led a normally sedate electorate to head to the polls, disgruntled with how slowly the country is emerging from the downturn. Yoshio Hidaka is one of those disgruntled voters. Dressed in his cleanly pressed white shirt and navy tie, Hidaka is the sort of buttoned-up conservative that the LDP could count on for party loyalty. And for decades, it could. But Hidaka’s food importing company, the Robson Corporation, has seen business hit the skids this last year. It’s changed how Hidaka plans to vote. 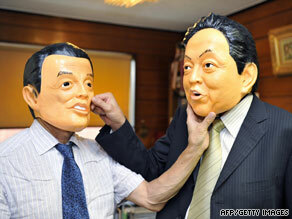 “Whoever the LDP produced as the prime minister, he wasn’t able to change the world. Especially the last three prime ministers. All of them resigned,” said Hidaka, referring to the revolving door of prime ministers in Japan, all in office about a year. “Unfortunately, the constant change of prime ministers then was met with this economic crisis. Therefore, I don’t think I’m the only one who thinks something has to change.” And he’s not. Polls show the opposition, the Democratic Party of Japan, will snag more than 300 of the 480 seats up for grabs in the lower house of Japan’s parliament. If the DPJ does win a majority, it will be the first time it will govern the world’s second-largest economy.